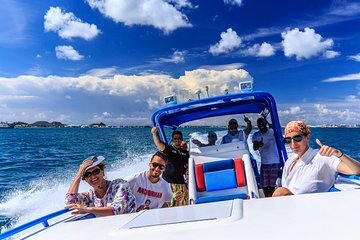 Explore the island of Anguilla on this 7-hour power boat excursion from Philipsburg. Snorkel, swim, and explore the island, then stop at a local restaurant for lunch. Open bar, use of snorkel equipment, and round-trip hotel transportation included. Be ready for pickup at your Philipsburg hotel prior to your tour's 9am departure. If you have arrived in St. Maarten on a cruise ship, you'll meet your guide for pickup at Bobby's Marina. Step aboard the power boat and cruise over to the French side of the island while your guide provides some historical commentary, then depart Marigot Bay bound for Anguilla's Rendezvous Bay. Stop first at Cap Juluca for a swim in the aquamarine waters, then continue on for a cruise around the southern tip of Anguilla up to Little Bay and Sandy Island. At both locations, spend some time relaxing on the beach and going snorkeling using the provided gear. At lunch time, hit up Crocus Bay's Da'Vida restaurant, where you have the choice of traditional barbecue or international cuisine. When you've finished lunch, head over to Meads Bay, located in the Anguilla Marine Park. Home to a protected beach and a floating bar, this beach is a great place to relax and finish out your memorable tour. Return to St. Maarten as the sun sets, finishing your 7-hour trip with drop-off back at Bobby's Marina or your local hotel. Billy Bones boat charters was an amazing experience! The Captain Miguel as well as A.J. the guide were awesome hosts that treated us like family. Special shout out to Miguel for the cliff diving tips. Lunch at Davidas was delicious. I would recommend to anyone who wants to visit Anguilla to use this excursion. Every beach was better than the other. Don't even think twice, BOOK IT! - The staff: AJ and Captain Nico were incredible!! They kept the whole boat smiling and laughing for the entire trip. They have a knack for making their guests feel right at home and comfortable. They weren't boring, always cracking jokes and smiling ear to ear, and it in turn rubs off on you! - The music on the boat!! Ok so maybe I'm a big music lover and happen to love reggae and reggaeton but it seemed like they handpicked the most perfect songs to cruise between islands in the Carribbean.....5 stars for the music! - Overall it was the best part of my trip to St. Martin. I am 100% going to do this one again next time I'm there and hope that AJ and Nico will be there! I actually got a bit emotional looking at my videos when I got back home, made some amazing memories!! THANK YOU BILLY BONES! SO much fun! DO IT! Knowledgeable and experienced crew who know how to have fun. A beautiful tour too. Will be doing this again next time Im on the island! This was a great trip and a great way to see Anguilla. The swimming and snorkel stops we very nice. Sean and Nicholas did a great job with providing information about the sights and the boat and were very helpful.. Everyone enjoyed the beer and rum punch. Loved it. We're 63 and older than the others in our group. Lots of fun. Be prepared to jump off the boat. I was nervous and Chris and Shawn were very helpful. I don't snorkel or jump of cliffs, but many of the others did and had a blast. The speedboat was very nice and drinks were plentiful. The choices were water, coke, Sprite, beer or rum punch. Plenty for all. There were 14 in our group. Very comfortable. Lunch was good with plenty of choices. We eat gluten free and the chicken salads were yummy. We visited beaches used by the wealthy that we could never get to otherwise. Fun to be on the edges of resorts we couldn't afford. Great day. Money well spent.